Even the most discerning of cats will consider themselves fortunate to dine on GOURMET®Gold: a menu of savoury recipes to spoil even a sophisticated palate every day with a wide choice of different flavours and taste experiences. That is why GOURMET Gold has created Double Delicacies recipes which combine tender chunks with gently cooked fine flakes for a subtle blend of tastes and textures. With double the pleasure in one meal, Double Delicacies are doubly hard to resist! Our multipack selection contains four delicious recipes with beef and chicken, rabbit and liver, ocean fish and spinach, and duck and turkey. Each is accompanied by a delicious sauce, and as our recipes are nutritionally balanced and complete, your cat will feel as good as they should. How can they resist? Our Gourmet Gold Double Delicacies multipack contains delicious recipes with Beef & Chicken, Beef & Chicken with Tomato, Ocean Fish with Spinach, Duck & Turkey. Complete pet food for adult cats. 100% complete and balanced nutritional pet food for adult cats (aged 1 to 7). Offers your cat the pleasure of a delicate and smooth sensation. Served in 85g cans to keep every meal fresh and convenient. Packed with essential vitamins and minerals to keep your adult cat healthy. No added artificial colourants, flavourings, preservatives. You don't want your cat to get bored with his meals so you always look for different food choices for him to enjoy. That is why GOURMET Gold has created Double Delicacies, delicious recipes to spoil his sophisticated palate with a different taste experience every day. Tender chunks combined with carefully cooked fine flakes: the ideal combination of two different textures in the same meal to offer your cat the pleasure of a subtle blend of tastes and textures. 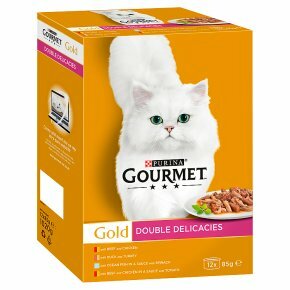 Double Delicacies from GOURMET Gold, double delight for your cat! All GOURMET Gold recipes have no added artificial colourants, preservatives and flavourings. For an average adult cat (4kg), feed 4 cans per day in at least 2 separate meals. The adult maintenance averages are based on moderately active cats at normal environmental temperatures. Individual needs vary and feeding should be adjusted as required to maintain your cat at a lean, healthy body weight. Serve at room temperature. Clean, fresh drinking water should always be available.